Imagine a world without books. The Barbara Bush Foundation recently tweeted, “60 percent of the kindergartners in neighborhoods where children did poorly in school did not own a single book.” According to the U.S. Department of Education (DOE), children not ready for kindergarten are three to four times more likely to drop out of school; 40% more likely to become teen parents; and 70% more likely to commit violent crimes. Amy Walstrum (left) and Kimberly Baker, board members and volunteers for Imagination Library of Talbot County, recently promoted their program at the Pickering Creek Harvest Hoedown. She recalls getting the nudge to deal with the literacy issue in Talbot County after hearing statistics that Talbot County’s kindergarten readiness scores were second from the bottom in the State of Maryland. She shared that for the 2014-2015 school year the readiness scores have improved in ranking, yet only 53% of kindergartners in Talbot County were fully school-ready. Cristy did some research and learned about Dolly Parton’s Imagination Library. The program was developed by Dolly Parton in 1996, through the Dollywood Foundation, for preschool children in her home area of Sevier County, Tennessee, which had one of the country’s highest illiteracy rates. Dolly wanted children to have their own personal library of books that would encourage them to love reading. Through the program, children from birth through their fifth birthday, receive a free monthly book that is mailed to their homes. The books are carefully selected by an expert committee and are age-appropriate, have positive themes that promote self-esteem and confidence and include classics, as well as new award-winning books. The Penguin Group both prints and ships the books. As the program began improving both reading readiness and early literacy rates in East Tennessee, Dolly received many requests to duplicate her program. In 2000, she began offering replication of the program to communities that would be willing to financially support it in their areas. Imagination Library of Talbot County (ILTC) is an affiliate of Dolly Parton’s Imagination Library (DPIL). Currently, there are over 1,800 communities across the United States that have Imagination Libraries. Over the past several years it has expanded to Canada, the U.K. and Australia. Each month 880,000 books are mailed and, to date, over 70 million books have been given away worldwide. In order to bring the books to the children, a local champion must pay for the cost of the books and their mailing. The average cost for each child is $25 per year, which includes 12 books a year per child. In Talbot County, if they registered every child, the cost would be approximately $49,000 per year. Cristy partnered with Francesca Wiseman and began looking for funding for the project. The two wrote grants and reached out to area civic organizations. 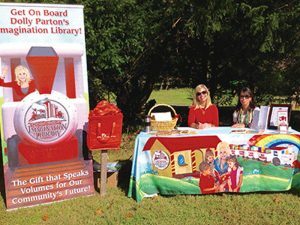 On April 1, 2013, Imagination Library of Talbot County was established as an official affiliate of Dolly Parton’s Imagination Library and a fund of the Mid-Shore Community Foundation. An all-volunteer staff serves as its Advisory Board and currently runs ILTC and includes Cristy Morrell, Francesca Wiseman, Karen Broujos, Amy Walstrum, Kimberly Baker, Kristina Henry and Charles Wrightson. These seven volunteers raise money, register children, promote the program, maintain databases, create and administer evaluations and surveys and develop outreach programs. To date, Talbot County has 1,100 active members and has mailed over 19,000 books to area children. Families have expressed excitement and pleasure over receiving books for their children. Through ILTC family surveys, many parents have stated that they are reading to their children more than before, and many older siblings are equally excited to see the books arrive as they enjoy both the stories and reading to their younger brother or sister. Organizations and business have been financially supportive and encouraging as they see the inherent value in an educated community. Since then, ILTC has received support from individuals and such businesses, organizations and foundations as Christmas in St. Michaels, the Dock Street Foundation, Eastern Shore Vacation Rentals, the English Family Foundation, McDonald’s of Easton, the Michael and Nancy Klein Foundation, PNC Foundation, Ronald McDonald House Charities of Baltimore, the Rotary Club of Easton, Safeway Foundation, St. Johns Foundation, the United Fund of Talbot County and the Women and Girls Fund. Imagination Library of Talbot County collaborates with the following local organizations to help them identify preschool children who are eligible and to educate parents on the importance of early literacy. Talbot County Judy Center, Critchlow Adkins Children’s Centers, Talbot Family Network, Talbot County Early Head Start, Shore Up! Inc. Head Start, Shore Health Easton Memorial Hospital, Talbot County School Board, area elementary schools, Family Resource Center, St. Vincent de Paul Charities, Oxford Library, Women, Infants, and Children (WIC), Oxford Community Center, Tilghman Island Area Youth Association, St. Michael’s Community Center, BAAM, Inc. – Building African American Minds, Healthy Families, The Talbot County Infants and Toddlers, Chesapeake Multicultural Center, preschools, daycares and churches, Talbot County Free Libraries and YMCA of the Chesapeake. In addition, the group has also assisted groups in Caroline, Kent and Queen Anne’s counties to establish their own Imagination Library affiliates. Recently, the women created a ¼-mile story walk for Pickering Creek’s Harvest Hoedown that shows families how to engage their children in reading. They hope to offer the story walk to other organizations for their events. The ILTC program needs continued financial support to sustain it for the future. According to Cristy, successful Imagination Libraries have a strong individual donor base. She encourages people to consider donating to the group, whether they are individuals with a passion about reading, book clubs or civic organizations. A donation of $25 supports one child for one year, including 12 books. She also encourages everyone who knows a child between birth and age five to have them visit imaginarylibraryoftalbotcounty.org to sign up. For further information, contact Cristy Morrell at 410-310-2757. ~ Originally printed in November 2015. 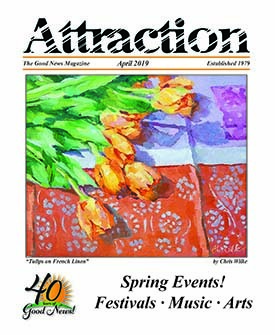 This column in Attraction, by Amelia Blades Steward, will visit the faces of those who have benefited from the generous and tireless work of the nonprofits on the Mid Shore. Amy has been a freelance writer in our community for over 15 years and offers a glimpse into the lives of residents on the Mid Shore who she has met along the way.